← Spring Into Action: Outdoor Living – and Building! Busy. As I said above, it is the peak time for interest in enhancing outdoor living spaces. I try hard to get the masses to think about new deck, screen porch, patio, pergola and other outdoor structures, spaces and amenities during the late fall, winter and early spring times. Try as I might, April and May continue to be peak months for call volume, design consultations and project proposals. And, glad to say and see, we are seeing an up-tick in all areas compared to last year. One more sign, I think, of the strength of the value of outdoor living projects when it comes to lifestyle and your overall home’s value. Frustrated. Technology is a great thing…when it works as intended or expected. But, when it doesn’t – or fails completely – it can bring some misery and frustration to your life…how much depending on how much you’re dependent on the technology. I am fairly dependent; there is more technology associated with the business of being a deck builder than one might imagine. Two weeks ago, I had a fairly significant PC failure. Aaaaagh! Backups were in place. But, as I’ve realized, they are only as good as a) what you have to restore them to and b) the speed at which you can do the restores. I promised not to dwell (whine? ), but it wasn’t fun. Functional, yes…but not 100% efficient. Earlier this week, I got my repaired PC back (failed video card) and I’m fully recovered at this point. Whew. Our crews are running 2 – 3 projects concurrently right now around the Des Moines area, sized anywhere from a front porch enhancement (nice Azek railing, trim and lighting package) to a new 3-season room and composite (TimberTech) deck combination project. I’ve got some video and pics of the latter in progress so look for those here and on our YouTube channel in the near future. 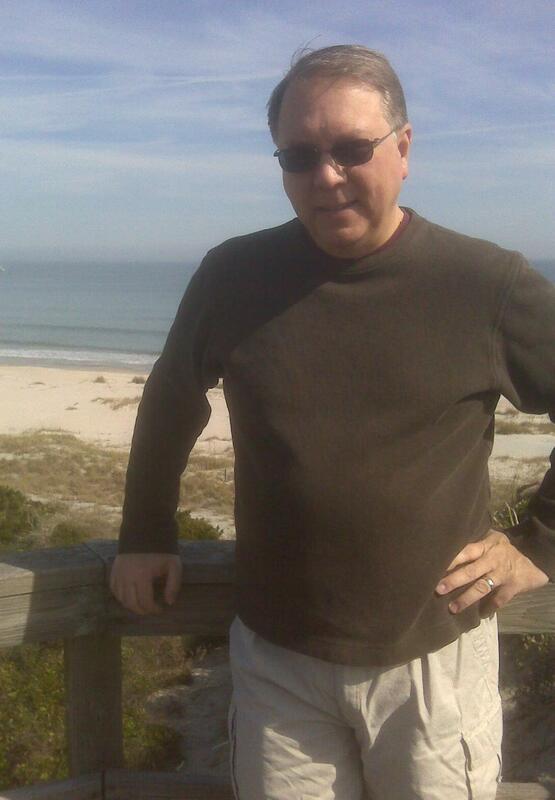 I can’t believe how much damage I am still seeing from the effect of the harsh winter we had. 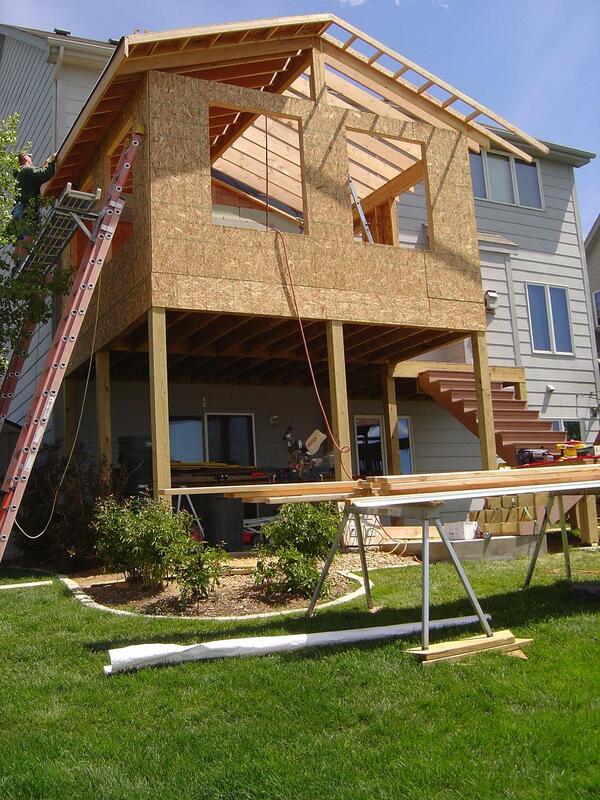 We’ve got a project on the calendar to replace a West Des Moines deck that collapsed – fell off the house – from snow load. On a weekly basis, I’m called about or see similar situations. The amount of frost heave damage to decks and patios last year exceeds anything I’ve seen in past years. 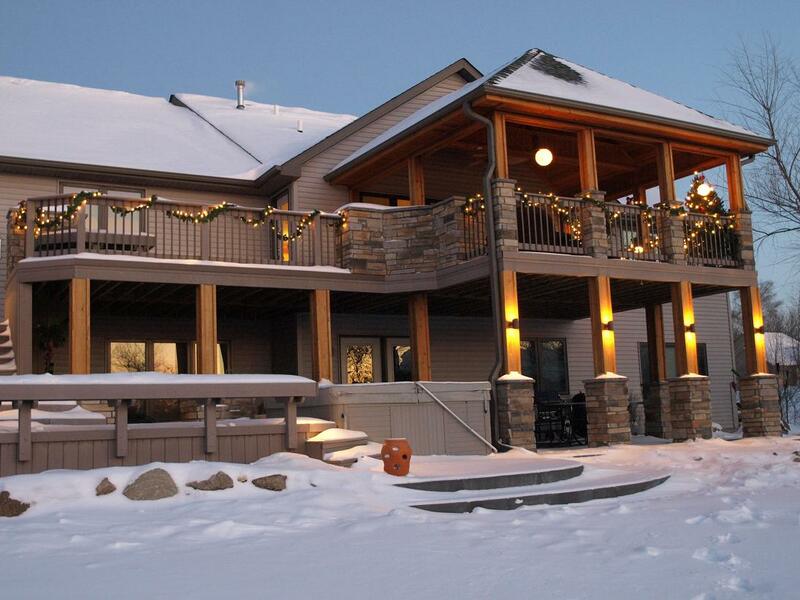 Keep in mind folks, that winter is not always the cause of the damage to decks and patios. The more common cause is the shortcuts too many builders and contractors take when building these structures. 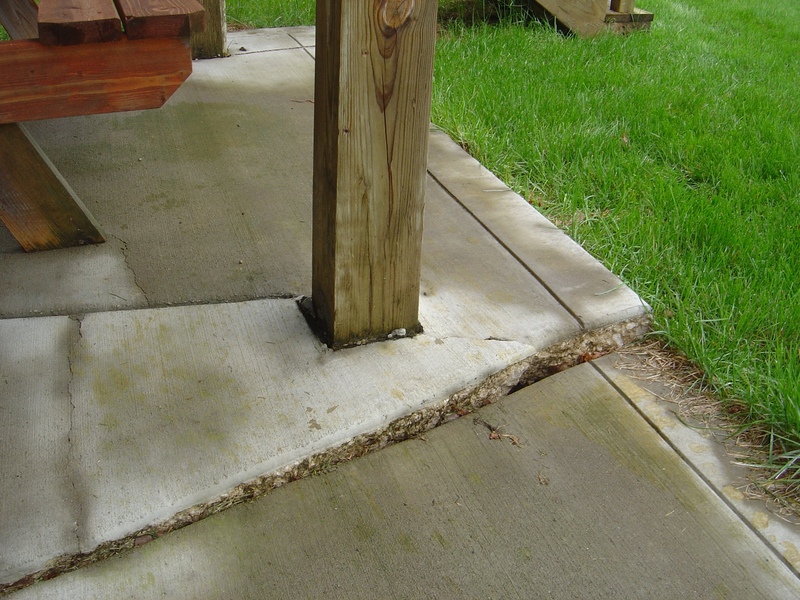 These shortcuts fall primarily in two areas: 1) insufficient support at and/or connectivity to the house, and 2) insufficient footings under the deck support posts. The latter can result in your deck posts (and the deck attached to them) “heaving” up from the ground when the ground freezes and thaws; it’s the backyard version of a street pothole. The former doesn’t provide the support required for the snow loads (and sometimes the “people” load) associated with our climate. 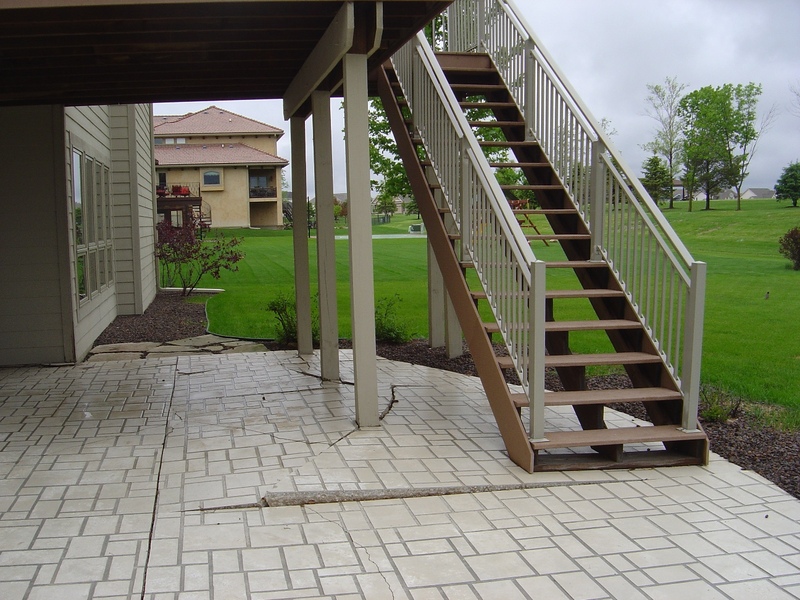 Again, not to dwell, but if you have concerns about your deck’s structure and safety, contact us and we’ll be glad to discuss these issues with you further. NADRA, the North American Deck and Railing Association delegates May as Deck Safety Month; contact us for more information. Our national and local web sites were spruced up a bit earlier this month; hopefully, you like the result. 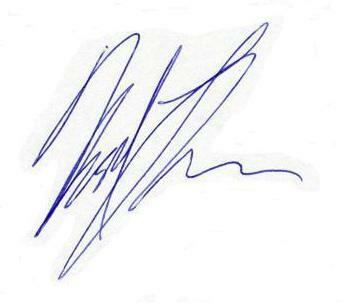 As with any technology transition, there are transition issues (in addition to my technology frustrations noted above). One of those issues is that I’m currently limited in what I can add or change content-wise on the site (see also, the “Busy” point, above). I’ve got some new project pics and other information to get up there, but can’t do it right yet. So, stay tuned…check back. Our favorite landscaper, Wright Outdoor Solutions, has joined the social media world with a nice, new Facebook page – check it out! We’ve co-op’ed with Wright on a few projects over the years (including one already this spring), coordinating design and implementation plans. They’re a great group to work with. Lastly, but certainly not leastly, our new outdoor kitchen program is in full swing. With the prime grilling and outdoor entertaining season ahead of us, we’ll be promoting this over the coming weeks starting with an insert in this coming weekend’s Des Moines Sunday Register. 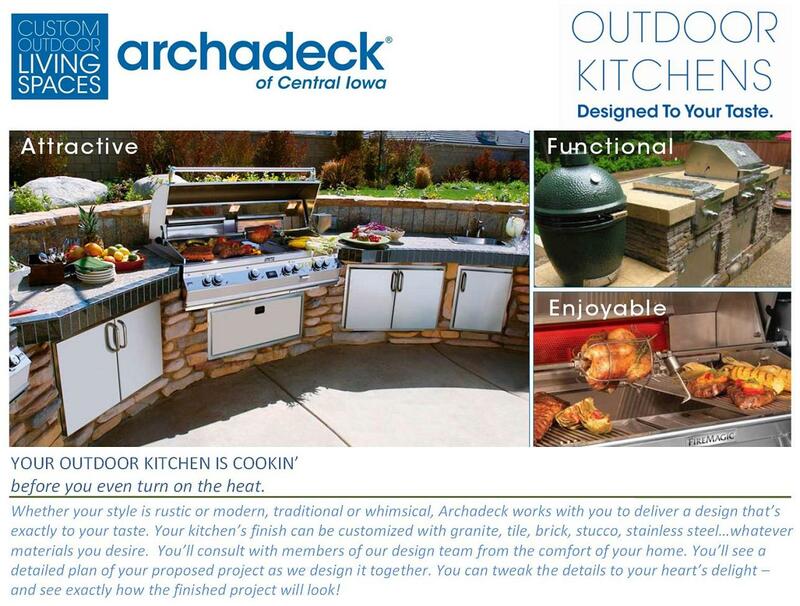 Look for more information on our outdoor kitchen program here and on our web site next week. 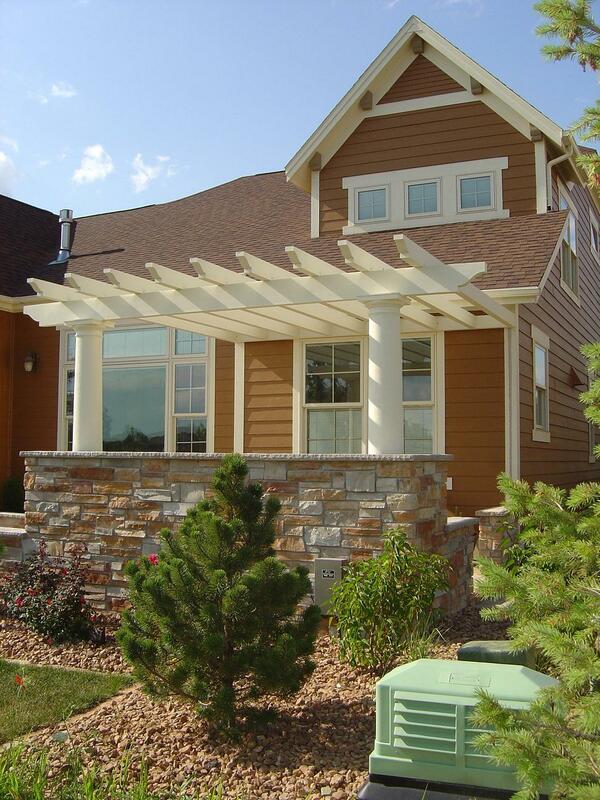 Or, give us a call anytime and we can schedule an appointment to review your outdoor kitchen needs and interests. That was a quick tour of what’s been going on in the Archadeck backyard the past few weeks. Whats going (to go) on in your backyard? We’d love to hear from you. This entry was posted in 3-Season Rooms, 4-Season Rooms, Deck Railings, Decks and Decking, Outdoor Living, Patios, Pergolas, Screen Porches, Uncategorized, Wood-Alternative Decking, Wood-Plastic Composites. Bookmark the permalink.